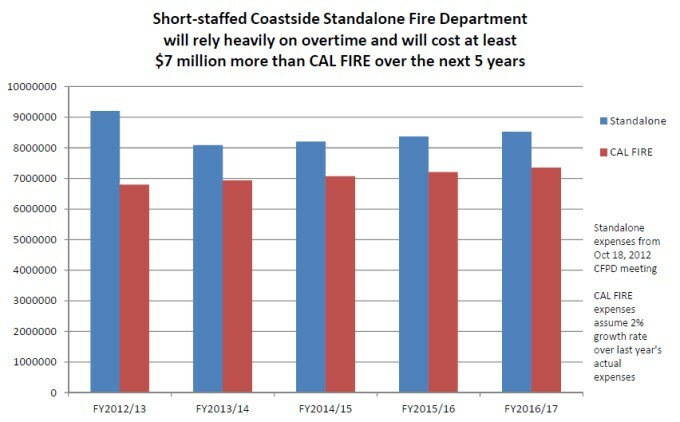 The new standalone fire department proposed by Directors Alifano, Mackintosh, and Riddell will be short-staffed from Day One, will rely heavily on overtime, and will cost at least $7 million more than CAL FIRE over the next five years. This is according to the documentation provided in the October 18 Coastside Fire Protection District Board Packet. Attachment D (page 23) shows staffing requirements. We currently have 35 full-time CAL FIRE firefighters staffing our fire stations. CAL FIRE firefighters work longer hours for less pay than would the firefighters of the proposed new standalone fire department. The last round of expensive consultants showed we would need approximately 42 firefighters working shorter hours to provide the same amount of coverage as we currently get from CAL FIRE. Yet attachment D’s budget covers only 34.5 full-time firefighters. Attachment E (page 25) of the board packet shows the projected 5-year costs for this new, short-staffed, standalone fire department at $42.4 million. Last year’s actual expenses with CAL FIRE were $6.66 million. Assuming that CAL FIRE’s costs rise 2% per year over the next 5 years, the CAL FIRE 5-year cost would total $35.4 million. The new, short-staffed fire department will cost on average at least $1.4 million more per year than CAL FIRE over the next five years. Update: the CFPD budget presented on October 18, 2012 was poorly done and did not add up. The October 18 Board Presentation did not specify amounts for overtime in the annual budget (10/18/12 attachment D), but did include $600k annually for overtime in the 5 year plan (10/18/12 attachment E). There was no way of knowing this looking at the budget as presented. This was clarified a month later in the November 24, 2012 Board Presentation – see 11/24 attachment B. Thanks to the tireless work of dozens of dedicated volunteers, we are pleased to announce we now have more than the required 2,714 signatures on each of the three recall petitions for Coastside Fire Protection District Directors Mike Alifano, Gary Riddell and Douglas Mackintosh. This means that when we turn in the petitions to San Mateo County Elections, they will be required to accept the petitions for filing. We have until Friday, October 26 to file the petitions, and we expect to file the petitions during the week of October 22. Volunteers will continue to gather signatures up until the day we file the petitions, since we’ll need every signature we can get to make sure we qualify the petitions for the ballot. We will have booths at the Half Moon Bay Pumpkin Festival to collect signatures. After County Elections accepts the filed petitions they have 30 business days to verify each signature, or they may choose to verify a random sampling of signatures. San Mateo County Elections Manager David Tom said in the August 29 HMB Review that because the petitions have a relatively small number of signatures, he expects they will verify each signature. If the number of valid signatures is greater than or equal to the minimum required number, County Elections certifies the petition as sufficient, notifies the proponents, and submits a certificate of sufficiency to the governing board. Within 14 days after the meeting at which the governing body received the certificate of sufficiency, the governing body issues an order for an election to be held. The election is held between 88 and 125 days after the issuance of the order. Candidates may file nomination papers and declarations of candidacy after the order of the election is issued and up to 75 days prior to the date of the election. By law, Alifano, Riddell, and Mackintosh may not succeed themselves or each other in a recall election. Please see sections II, subsections G through L starting on page 22 of the PDF at this link for the official process. Also see section III on page 25. California Elections Codes are at this link. There are some minor details in the Code that are not covered in the PDF above.